The newest book from award-winning management thinker, Subir Chowdhury, author of the best-selling The Power of Six Sigma and The Ice Cream Maker. Purchase prior to the February 21, 2017 release date for a professional discount price of $20(USD). Use coupon code PRO2017 for free shipping (within the U.S.). Note that books ship six weeks after the release date. 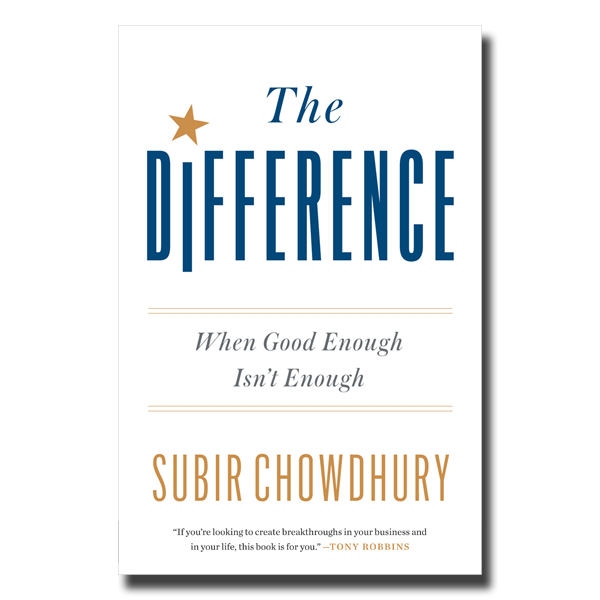 The Difference is the latest edition of author Subir Chowdhury’s life work in management and business practices. Subir holds up lessons from the last 20 years that clearly shows how people distinguish one organization from another. Even if you have the best processes and training program available in the world, your transformation will not succeed unless you first improve the culture of the workforce. This is the heart of the matter – where the hard work begins and ends. To move the dial toward excellence, you must nurture great loyalty and a passion for excellence within the people who make up the workforce. Necessarily, the work must include everyone in the organization: from the C-suite to the shop floor. Subir Chowdhury is one of the world’s leading management consultants, who works with Fortune 500 companies to improve their processes, operations, quality, and performance. He is the bestselling author of The Power of Six Sigma, and The Ice Cream Maker. Be among the first readers of this compelling new book. ASI has been authorized by Penguin-Random House to offer a special professional discount until the official release in February 2017. Purchase your advance before February 21, 2017 for a professional discount. Use the coupon code “PRO2017” for free shipping (within the U.S. only).